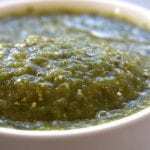 A zesty and savory salsa perfect for enchiladas, tacos and burritos. Broil for approximately 10 mins or until tomatillos are blackened in spots, turning hallway through. Let cool slightly. Roughly chop onion, cilantro and garlic and place in a food processor. When tomatillos & jalapeño are cool enough to handle add to processor. Process until all ingredients are fully incorporated and no large chunks remain.